The Qur'an does not constitute the sole source of doctrine and legislation in Islam. During Muhammad's life and after his death, complementary information of a legislative nature was indeed sought in the study of the words and deeds of the Prophet. Although writing was used in the transmission of hadith from the very beginning, a lot of this came also from the oral tradition. Those who undertook to assemble them in collections made the kind of enquiries which are always very taxing before recording accounts of past events. They nevertheless had a great regard for accuracy in their arduous task of collecting information. This is illustrated by the fact that for all of the Prophet's sayings, the most venerable collections always bear the names of those responsible for the account, going right back to the person who first collected the information from members of Muhammad's family or his companions. A very large number of collections of the Prophet's words and deeds thus appeared under the title of Hadiths. The exact meaning of the word is 'utterances', but it is also customary to use it to mean the narration of his deeds. Some of the collections were made public in the decades following Muhammad's death. Just over two hundred years were to pass before some of the most important collections appeared. The most authentic record of the facts is in the collections of Al Bukhari and Muslim, which date from over two hundred years after Muhammad and which provide a wider trustworthy account. In recent years, a bilingual Arabic/English edition has been provided by Doctor Muhammed Muhsin Khan, of the Islamic University of Madina. [ Pub. Sethi Straw Board Mills (Conversion) Ltd and Taleem-ul-Qur'an Trust, Gujranwala, Cantt. Pakistan. 1st edition 1971, for Sahih Al Bukhari.] Al Bukhari's work is generally regarded as the most authentic after the Qur'an and was translated into French (1903-1914) by Houdas and Marcais under the title Les Traditions Islamiques (Islamic Traditions). The Hadiths are therefore accessible to those who do not speak Arabic. One must, however, be wary of certain translations made by Europeans, including the French translation, because they contain inaccuracies and untruths which are often more of interpretation than of actual translation. Sometimes, they considerably change the real meaning of a hadith, to such an extent indeed that they attribute a sense to it which it does not contain. As regards their origins, some of the hadiths and Gospels have one point in common which is that neither of them was compiled by an author who was an eyewitness of the events he describes. Nor were they compiled until some time after the events recorded. The hadiths, like the Gospels, have not all been accepted as authentic. Only a small number of them receive the quasi-unanimous approval of specialists in Muslim Tradition so that, except al-Muwatta, Sahih Muslim and Sahih al-Bukhari, one finds in the same book, hadiths presumed to be authentic side by side with ones which are either dubious, or should be rejected outright. In contrast to Canonic Gospels which though questioned by some modern scholars but which have never been contested by Christian high authorities, even those hadiths that are most worthy to be considered as authentic have been the subject of criticism. Very early in the history of Islam, masters in Islamic thought exercised a thorough criticism of the hadiths, although the basic book (The Qur'an) remained the book of reference and was not to be questioned. I have compared the findings made during an examination of the hadiths with those already set out in the section on the Qur'an and modern science. The results of this comparison speak for themselves. The difference is in fact quite staggering between the accuracy of the data contained in the Qur'an, when compared with modern scientific knowledge, and the highly questionable character of certain statements in the hadiths on subjects whose tenor is essentially scientific. These are the only hadiths to have been dealt with in this study. Hadiths which have as their subject the interpretation of certain verses of the Qur'an sometimes lead to commentaries which are hardly acceptable today. We have already seen the great significance of one verse (sura 36, verse 36) dealing with the Sun which "runs its course to a settled place". Here is the interpretation given of it in a hadith: "At sunset, the sun . . . prostrates itself underneath the Throne, and takes permission to rise again, and it is permitted and then (a time will come when) it will be about to prostrate itself . . . it will ask permission to go on its course . . . it will be ordered to return whence it has come and so it will rise in the West . . ." (Sahih Al Bukhari). The original text (The Book of the Beginning of the Creation, Vol. IV page 283, part 54, chapter IV, number 421) is obscure and difficult to translate. This passage nevertheless contains an allegory which implies the notion of a course the Sun runs in relation to the Earth: science has shown the contrary to be the case. The authenticity of this hadith is doubtful (Zanni). Another passage from the same work (The Book of the Beginning of the Creation, vol. 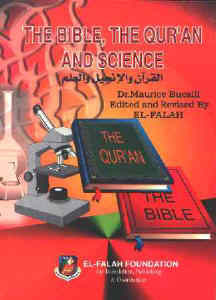 IV page 283, part 54, chapter 6, number 430) estimates the initial stages in the development of the embryo very strangely in time: a forty-day period for the grouping of the elements which are to constitute the human being, another forty days during which the embryo is represented as 'something which clings', and a third forty-day period when the embryo is designated by the term 'chewed flesh'. Once the angels have intervened to define what this individual's future is to be, a soul is breathed into him. This description of embryonic evolution does not agree with modern data. Whereas the Qur'an gives absolutely no practical advice on the remedial arts, except for a single comment (sura 16, verse 69) on the possibility of using honey as a therapeutic aid (without indicating the illness involved), the hadiths devote a great deal of space to these subjects. A whole section of Al Bukhari's collection (part 76) is concerned with medicine. In the French translation by Houdas and Marcais it goes from page 62 to 91 of volume 4, and in Doctor Muhammad Muhsin Khan's bilingual Arabic/English edition from page 395 to 452, of volume VII. There can be no doubt that these pages contain some hadiths which are conjectural (Zanni), but they are interesting as a whole because they provide an outline of the opinions on various medical subjects that it was possible to hold at the time. One might add to them several hadiths inserted in other parts of Al Bukhari's collection which have a medical tenor. This is how we come to find statements in them on the harms caused by the Evil Eye, witchcraft and the possibility of exorcism; although a certain restriction is imposed on the paid use of the Qur'an for this purpose. There is a hadith which stresses that certain kinds of date may serve as protection against the effects of magic, and magic may be used against poisonous snakebites. We should not be surprised however to find that at a time when there were limited possibilities for the scientific use of drugs, people were advised to rely on simple practices; natural treatments such as blood-letting, cupping, and cauterization, head-shaving against lice, the use of camel's milk and certain seeds such as black cumin, and plants such as indian Qust. It was also recommended to burn a mat made of palm-tree leaves and put the ash from it into a wound to stop bleeding. In emergencies, all available means that might genuinely be of use had to be employed. It does not seem-a priori-to be a very good idea, however, to suggest that people drink camel's urine. --the origins of a fever. there are four statements bearing witness to the fact that "fever is from the heat of hell" (Al Bukhari, The Book of Medicine, vol. VII, chapter 28, page 416). --abortion provoked by the sight of a snake (which can also blind). This is mentioned in The Book of the Beginning of Creation, Vol. IV(chapter 13 and 14, pages 330 & 334). --haemorrhages between periods. The Book of Menses (Menstrual Periods) Vol. VI, part 6, pages 490 & 495 contains two hadiths on the cause of haemorrhages between periods (chapters 21 & 28). They refer to two women: in the case of the first, there is a description (undetailed) of the symptoms, with a statement that the haemorrhage comes from a blood vessel; in the second, the woman had experienced haemorrhages between periods for seven years, and the same vascular origin is stated. One might suggest hypotheses as to the real causes of the above, but it is not easy to see what arguments could have been produced at the time to support this diagnosis. This could nevertheless have been quite accurate. --the statement that diseases are not contagious. Al Bukhari's collection of hadiths refers in several places (chapters 19, 25, 30, 31, 53 and 54, Vol. VII, part 76, of the Book of Medicine) to certain special cases, e.g. leprosy (page 408), plague (pages 418 & 422), camel's scabies (page 447), and also provides general statements. The latter are however placed side by side with glaringly contradictory remarks: it is recommended, for example, not to go to areas where there is plague, and to stay away from lepers. Consequently, it is possible to conclude that certain hadiths exist which are scientifically unacceptable. There is a doubt surrounding their authenticity. The purpose of reference to them lies solely in the comparison that they occasion with the verses of the Qur'an mentioned above: these do not contain a single inaccurate statement. This observation clearly has considerable importance. --firstly, a large number of Believers knew the Qur'an by heart because, like the Prophet, they had recited it many, many times; transcriptions of the text of the Qur'an already existed moreover, which were made at the time of the Prophet and even before the Hegira [ The Hegira was in 622, ten years before Muhammad's death.]. -secondly, the members of his following who were closest to him and the Believers who had witnessed his words and deeds had remembered them and relied on them for sUPport, in addition to the Qur'an, when defining a nascent doctrine and legislation. In the years that were to follow the Prophet's death, texts were to be compiled which recorded the two groups of teachings he had left. The first gathering of hadiths was performed roughly forty years after the Hegira, but a first collection of Qur'anic texts had been made beforehand under Caliph Abu Bakr, and in particular Caliph Uthman, the second of whom published a definitive text during his Caliphate, i.e. between the twelfth and twenty-fourth years following Muhammad's death. --on the one hand, statements in the Qur'an which often appear to be commonplace, but which conceal data that science was later to bring to light. --on the other hand, certain statements in the hadiths which are shown to be in absolute agreement with the ideas of their times but which contain opinions that are deemed scientifically unacceptable today. These occur in an aggregate of statements concerning Islamic doctrine and legislation, whose authenticity is unquestioningly acknowledged. Finally, it must be pointed out that Muhammad's own attitude was quitedifferent towards the Qur'an from what it was towards his personal sayings. The Qur'an was proclaimed by him to be a divine Revelation. Over a period of twenty years, the Prophet classified its sections with the greatest of care, as we have seen. The Qur'an represented what had to be written down during his own lifetime and learned by heart to become part of the liturgy of prayers. The hadiths are said, in principle, to provide an account of his deeds and personal reflections, but he left it to others to find an example in them for their own behaviour and to make them public however they liked: he did not give any instructions.